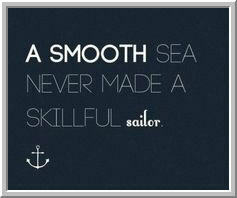 If you're going to be a skillful sailor, you have to weather some storms. We build and expand skills by testing them, and that means that failure is an essential ingredient of success. It's the weight that we lift for one set of repetitions but not three that we should be tackling in the gym. After we succeed at one weight, we seek the next weight that will ensure our failure. 1) Thanks to Bella from SMB for pointing out this post from @kroyrunner89 on the work it takes to break a slump. It's a great example of how awareness of our mistakes can overcome trading-by-ego. I spoke with a trader a while back who went from unprofitable to profitable simply by changing one thing. Instead of getting bigger as trades went his way, he scaled out of his positions. That's it. He updated risk/reward in a clear headed way and became protective of profits instead of greedy for more. He replaced overconfidence with a realistic picture of how far a move is likely to extend. When you trade by rules, you suppress the ego and make doing the right thing more and more automatic. 2) Thanks to the eminiplayer site for posting this excellent analysis from Ziad on learning to become a successful trader. It's a true gem. A key point is that trading success requires far more than finding setups that "work". Whether a pattern is profitable is not just a function of that pattern, but of the context in which the pattern is embedded. The single greatest step forward in my trading this year occurred when I stopped making "trend" my unit of analysis and instead focused on "cycle". That opened the door to a simple recognition: the patterns that are profitable are a function of where we're at in a market cycle. In topping and bottoming phases, markets display mean reversion. In rising and falling phases, markets display momentum. The successful trader adapts to market cycles. Imposing our trading style on markets is a formula for guaranteed drawdown and frustration. The key to mastery is failing successfully. We fail successfully when failure does not take us out of the game (risk management) and when failure sparks adaptation and innovation. If we want to become a world class skier, we can't remain content with tackling small hills. But we also can't start at the highest peaks. In conquering trading hills we prepare ourselves to master the mountains. What Is Your Coping Style?